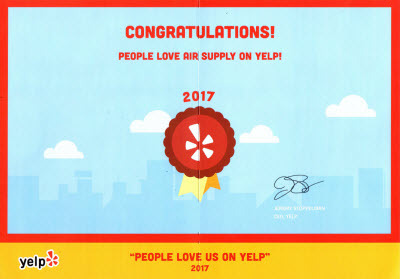 In the Las Vegas, NV Valley, the commercial and residential property owners locally and in surrounding areas have come to depend on Air Supply Heating and Air Conditioning for all of their HVAC system needs because of the dedication we have for our customers, superior workmanship, and traditional values we install on a consistent basis. 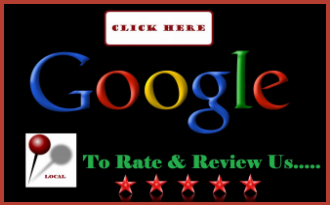 We are locally owned and operated; completely licensed, certified, and insured to provide our professional expertise and services to the community at affordable rates. 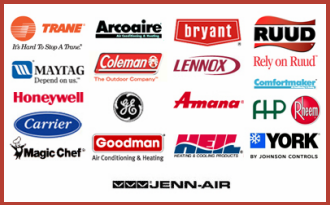 Air Supply Heating and Air Conditioning technicians are among the elite, having advanced training, experience in the industry, and remarkable skills that when coupled with premium quality products and equipment exclusive to licensed professionals, can ensure maximum results. 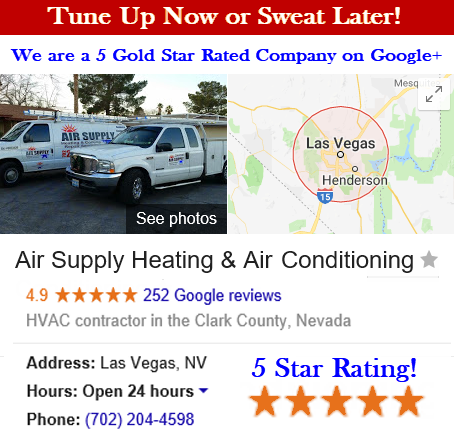 Air Supply Heating and Air Conditioning takes care of the air conditioning compressor’s found in Greater Las Vegas, Nevada homes and businesses. Problems the air conditioner compressor can have a lasting effect on the AC performance. Whether it requires repairing or replacing, Air Supply Heating and Air Conditioning can help you get it functioning at high efficiency. The air conditioning compressor in a split air conditioning system, which is the standard central AC found in most homes, is located in the outdoor unit. Its primary function is to circulate the necessary refrigerant that it requires for the heat exchange through the coils of the indoor and outdoor unit as well as supply the energy to the refrigerant. With a cylinder and piston and constructed like a motor, the compressor is powered by a motor. The refrigerant’s temperature changes into high pressure gas after the compressor compresses the gaseous refrigerant. High pressure forces the refrigerant to the outdoor coil through a line; the refrigerant then releases heat and condenses into a liquid. Refrigerant evaporates into gas again and absorbs the heat from inside your home after the liquid refrigerant had continued its trip from the indoor unit. The compressor cycles the returned refrigerant and the process starts all over again. Air conditioner compressors work over time keeping the locals cool during the long summers in the Las Vegas desert. The wear on the motor can be excessive, especially if the air conditioner units have been neglected; no maintenance, tune-ups, or inspections by a professional. Air Supply Heating and Air Conditioning can help you with any needed repairs. Simple dust and grime halt the function of your compressor causing the cooling cycle to halt. Loss of refrigerant can also occur originating from the compressor connectors developing leaks. Additionally, if any of those refrigerants comes into contact with the compressor, the compressor can sustain more damage. With Air Supply Heating and Air Conditioning, if your home or business’s air conditioners compressor falls short in the Las Vegas, Nevada Valley, we are available to come on site and assess the problem. If your compressor is in need of repair or replacing our experts will present the solutions to your problem and execute the service with precision and care. Call Air Supply Heating and Air Conditioning today for your air conditioning compressor needs.